Dubai Wholesale City ... world’s largest. Dubai has embarked on an ambitious plan to develop the world’s largest wholesale city covering 550 million sq ft at an estimated cost of Dh30 billion ($8.16 billion). 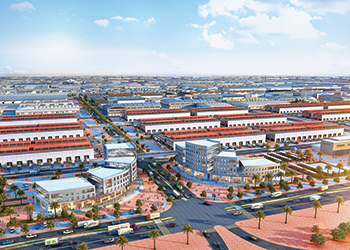 Dubai Wholesale City is designed to be an integrated city with a modern infrastructure and smart service and will be developed over 10 years by Dubai Holding, the investment vehicle of the UAE emirate’s ruler. The mega project, which was officially launched by His Highness Sheikh Mohammed bin Rashid Al Maktoum, Vice President and Prime Minister of the UAE and Ruler of Dubai, boasts specialised integrated trading parks and an international trade exhibition facility. The one-stop free zone is expected to host some 15,000 traders. It will also feature ‘country pavilions’ that include commercial centres and malls offering products from various countries including India, Malaysia, Thailand, Turkey, Australia, China, South Korea, Germany, Saudi Arabia, the US and South America. The new city, which will reportedly encompass the current location of Dubai Industrial City, will also benefit from the emirate’s advanced logistics services and its distinctive location near Al Maktoum International Airport and the Jebel Ali Port, two major gateways for global cargo and shipping industries. According to Dubai Holding, the hub will provide wholesale traders with comprehensive offerings including state-of-the-art infrastructure, roads, warehousing, storage facilities and support services, guaranteeing high operational efficiency and ease of doing business. The international business-to-business exhibition facility, meanwhile, will convene buyers with suppliers from around the world. The sizeable asset will serve as a mediator in global trade and open up a raft of service options to producers and traders, even while saving them time and effort, says Dubai Holding. The city will serve strategic sectors including food, construction materials, electrical appliances, electronics, furniture and décor, machinery, equipment, wood, vehicles and spare parts, and textiles and clothing. Its proximity to major markets connecting three quarters of the world’s population within a seven-hour flying time makes it an ideal meeting point between the east and the west and serves as a key factor in distinguishing it from other wholesale hubs worldwide, says Dubai Holding. The new development is expected to help increase the UAE’s contribution to the global wholesale trade sector that is valued at $4.3 trillion and expected to grow to $4.9 trillion in the next five years. Speaking at the launch, Sheikh Mohammed said the UAE was making headway with its strategic plan to diversify the national economy and reduce dependence on oil revenues.